What does it mean to “build your own computer?” Today, it is likely to mean you bought a motherboard, a power supply, and a case and put it all together. You might even have made an embedded computer using a few chips, including an off the shelf CPU. However, there are those guys (like me) who have built entire computers using FPGAs and some (not like me) who have built computers out of TTL chips, discrete components, and even relays and we have covered quite a few of them. It hasn’t always been that easy. Components are readily available now and relatively cheap (especially considering inflation). In the 1960’s, simple components cost more than you pay for them today and back then your hypothetical self was making less money. In just about every way imaginable, the cost was prohibitive. So what did you do if you were a kid saving money from a paper route in 1968 and you wanted to build a computer? Maybe you turned to How to Build a Working Digital Computer a book published in 1968 by [Edward Alcosser], [James Phillips], and [Allen Wolk]. This book did as the title promised: you could build a working digital computer. The components, though, were paper clips, tin cans, thread spools, and other household items. The only real electronic components you had to use were light bulbs and a battery, although you might also use store-bought switches in some places instead of the homemade versions shown in the book. As you might expect, it takes some ingenuity to build a computer out of items like this. The program storage was a tin can covered with paper. Brushes would sense where the paper had holes in them and each hole location was an encoded instruction (very similar to a punch card, but wrapped around in a cylinder). Encoders used empty thread spools, wrapped with wire and paper masks. Paper clips formed brushes and wood screws made the pointers so you could tell which number you dialed into the encoder (see picture to right). The only compromise? It was up to you to transfer data between some lights and some switches in the control unit. That is, when a certain light turned on, you were supposed to copy a pattern of lights into a bank of switches before continuing. There were ten instructions and 16 words of memory, so it was a pretty simple machine, but with no active devices (well, if you don’t include yourself) and mostly made from scrap, it was pretty impressive. You have to wonder how many of these actually got built. There was a commercial version made called the CT-650 (and, at $1000 each, we doubt many were sold). In addition, there have been several known complete builds including one that has a few YouTube videos (see below). A high school math club built one in 1975 (image at the top of this post), as did two ninth graders in 1972 (for about $150; but don’t forget you could buy a Ford Pinto in 1972 for about $2000 and $150 would almost pay your average month’s rent). I had that book. I built parts of it. I often tell people that one of my first computer efforts was made out of paper clips and they look at me funny. But it’s true! I actually read a book on the subject. No not that one. Later on. It covered both DTL and RTL, and naturally used light bulbs like what we stuck in original flash lights as indicators. It showed how to wire each item and even how to build the storage device. And so on. Never did build the thing the author wanted, but it was fun reading it. Oh dear. Now I remember. I did read it.Almost interesting. And then moved on to that other one. The nicest thing I can say is that I’m glad I wasn’t born 20 years earlier. Huh? I saw the opening picture to the article and wished I would have been born 20 years earlier. Sadly, when the book was written, high school students were already using minicomputers. Binary and logic was only one week. The rest of the time was spent learning how to do real work (sort, calculate, arrays, file systems storage, etc). In 1968, +/- a year, I took a summer course which taught me how to program in Digitals’s FOCALlanguage. We used a Teletype linked to a timesharing system at Bolt, Beranek and Newman in Cambridge, MA and stored our programs on paper tape. The next year, my school got a Teletype, linked to a PDP-8 at Natick High School. I believe the timesharing arrangement was called Project LOCAL, and allowed schools without computers to have terminals shared with schools that did have computers. In Portland, the county bought an HP 2000A Timeshare system with 32 I/O ports in 1969. Then each high school in the county could dial-in. By 1970 the teachers were all trained and it was introduced as a class. The ASR-33 teletype was put in a small room, with a chalkboard and a desk, and was basically the lab part of the class. A second ASR-35 was purchased, and the -33 was used only to create our paper-tapes. Then when you were done you loaded it into the -35 after dialing up the computer. HP was a great BASIC. It had a great filesystem, and lots of disk storage. So you only had to edit online after the initial paper tape load. I still have that book. It was what sparked my interest in computing. How hard would it be to add relays to act as automatic switches and other things so this wouldn’t have to rely on a human operator to correctly flip switches (or open and close paperclip “cores”)? In 1960 as a senior project at Cass Technical high school in Detroit I built a computer out of relays- it took 125 relays, had 6 words of 4 bit storage, an adder, and output display of neon lights. I built a paper tape reader that read the program off adding machine rolls that were hand punched. It was spread out on a 6 foot long plywood panel with everything labeled. My teacher, Mr. Larry Applebaum raised the money for it and it was left at the school. I don’t know what ever happened to it. I still have some of the documentation, but I do not think I have a photo. The new faculty probably thought it was a bomb and called the police. Not in those days. We actually made bombs, and rockets and a lot of stuff that made noise or fire. I don’t know how kids learn anything these days when you can’t blow up a little stuff. You could buy everything to make black powder in the corner drug store, without the druggist questioning you- he probably even helped with other suggestions. I remember in Jr High seeing a relay based computer about the time this book came out. He bought parts at Poly Pack, bags of questionable parts for cheap. He was rushing to get it to the Science Fair and had many failures. I noticed the diodes were glass and pointed out that he should have used the much more expensive plastic diodes that could handle more current than a 1N34a signal diode. Another order and he had a working computer. I remember one thing about it, the student pointed out a relay that ticked once a second or a little faster. That was the clock! I remember this book. It was given to me by the TV repair guy who had a shop in the first floor of the apartment building in Paterson, NJ that I lived in. Everybody called him Flash, and his shop was Clearview TV. By the time I could afford to buy tools and parts to build it real microcomputers were starting to show up. But I remember in my electronics class in high school that when we started studying digital electronics and truth tables, it was all review for me because I had absorbed the chapter on logic. That book and it’s frustration is what convinced my father to buy me a KIM-1. I wish I kept that board. You know I never used to do that before the surgery. Now I catch myself writing to when I mean too etc. Or wait… can I blame the editor! Yeah, yeah, that’s it…. the editor did it ;-) That’s my story and I’m sticking to it. This reminds me strangely of some of my friends in college last year. They built a “computer” – that is, an ALU, decoder, and some storage – entirely in the video game Minecraft. The similarity is that they also had to figure out how to make the logic work one switch at a time, out of available parts. The irony is that they did it in a simulation that runs on a perfectly good computer. Too cool. It was just a few years later that I read “Build Your Own Working Robot.” He used an “Eldon Powerride” and boards full of TTL parts. I had that book too– still do for that matter, and a couple of the follow-ups too. I have here one of his books as well. The customization one. That’s the one where he offers hundreds of suggestions and batches of programs. He also claims that the people who built Buster had sent him photos of the little fellow. Now the Rumba listening to you both type has more between its sensors then anything Buster did. I remember a TV series from the early 80s, I was a little kid, called “Video and Chips”. Featured each week a stage in construction of a robot you could build at home. I wonder if anyone ever did, and how it was controlled? I saw the opening picture and thouht the CERN caption contest had restarted. Very cool stuff. I was born in the early 70’s, so this sort of thing had disappeared by the time I started mashing key’s on my father’s Altair 8800 at age 6. It would have been fun to build one of those. BTW are we sure the woman in the photo is being bored by an actual computer? Surely they didn’t use knife switches in computers. Maybe it’s some sort of power distribution board. Yes, it was an actual computer composed of switching circuits (some of the switches were made out of paper clips) arranged in logic circuits. The specs are eye opening to say the least–2 4 bit words for input, 16 bits of temporary, hand operated storage. I think it had something like a 10 word instruction set. But yeah it WAS a digital computer. There are YouTube videos of one in action. Yeah I know about the computer from the book, all built using paperclips. Paperclip switches, paperclip bulb holders, etc. But the one in the pic uses knife switches. The type Frankenstein uses to switch on the lightning. They’re not cheap, and they can handle a lot more power than you’d need for a torch bulb. Just wondering why they’d use those type of switch, rather than something smaller and cheaper, or paperclips. Like I said in the afterthought to my reply, that section is the arithmetic unit, and it was built out of a lot of knife switches. (Probably the single most expensive section of the whole thing.) The reason knife switches were used was so that a bunch of them could be thrown at once. What you can barely see in the photo of the bored girl is that banks of switches were physically clamped together by the bats on their handles so that a bunch of them could be thrown together to set up the binary encoding for the two numbers and the states of the registers the computer was working on in that step. The device is described in chapter 4 in the book that the article links to, and d there’s at least one photograph. I suppose knife switches were used because they would have been the easiest for a non-electronics types to deal with and were necessary for reliability. In the videos above, a guy who actually built one of these talks about how he had to use springs to hold the paperclip whiskers against the juice can. Add-on to the above–Looks like the section in the picture was the arithmetic unit. I built the computer you see in the YouTube videos above. You know what might’ve been more interesting for that book? To get kids to make relays. 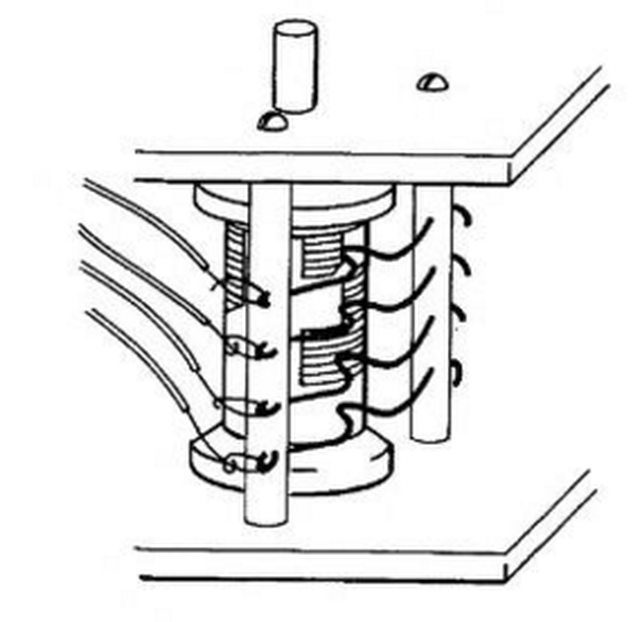 Electromagnets were common in 1950s and 60s books for geeky kids. Add a nail and a bit of wood or a clothes peg or something, and you could knock up a however-many way relay. Maybe even slightly more complex stuff, who knows? Would need a bit of experimenting to get good values for the relays, to have the hand-wound coils have decent pull and the right resistance. But I bet you could chain a good few of them into sequenced logic circuits. Maybe still have a drum that goes step by step manually to do the sequencing. Kids have tons of time, but not much money. If they could get hold of enamelled wire, they’d be able to wind their own relays. Then have something much more automatic. This paperclip-thing just doesn’t look like a lot of fun. Looks very frustrating, and it’s basically just a gigantic mess of switches wired up. Nothing actually *does* anything, no active components. The book could even start off with basic circuits, and build up as the kid produced more relays. BRB, off to 1960 with a really good idea for a book. When I found this book online I though it would be neat to build one, using off the shelf toggle switches and BCD rotary switches, whuch is what those hand built ones are made of thread spools. At first glance I thought it was making some kind of mnemonic memory circuit from stone knives and bearskins (or crude magnetic RAM from coiled paperclip wires) but it’s far less sophisticated. But then I got to really reading the book and found that all it is, is an electrified abacus. The human is the computer. The object described by the book just keeps track of some things. The input drum could have a trigger wheel on it to cycle relay switches to transfer each line of code into relay memory, instead of the human having to manually toggle the mechanical bits.